At a glance | Hisar | Tourism Hubs | Haryana Tourism Corporation Limited. The present city of Hisar, one of the important cities of North India, is situated 164 kilometers west of Delhi on the National Highway No.10. The city of Hisar was founded by a Muslim ruler, Firozshah Tughlaq in 1354 A.D. 'Hisar' is an Arabic word, which means 'Fort'. The city, which we know today as 'Hisar', was originally called 'Hisar Firoza (also Hisar-e-Firoza) or in other words, the 'Fort of Firoz'. But as the days rolled by, the very word 'Firoza' was dropped from its original name. It was here that the very first evidence of the presence of man was discovered with the excavation of Agroha, Banawali and Kunal. All of these were the pre-Harappan settlements, bringing for us the very first images of pre-historic times. The presence of the pillar in Hisar fort belonging to the time of Emperor Ashoka (234 A.D.), originally from Agroha and the discovery of coins of the Kushan Kings throw light on important facets of ancient India. The construction work of the Hisar city started in the year 1354 A.D. under the personal supervision of Firozshah himself who stayed here for a sufficient time. The boundary wall of Hisar Firoza was built of stones brought from the hills of Narsai. The fort city was also surrounded by a big ditch dug round the wall. A large and deep tank was constructed inside the fort, and the water used to replenish the ditch. Inside the fort, a fine palace having a complex of different buildings was built. Well laid-out gardens added to the beauty of the palace. The initial stage of the city, it has been reported was completed after the incessant work of two and a half years. The nobles and Amirs were also directed by the Sultan to get their residences built here. The fort-city had four gates, which were subsequently named as the Delhi Gate to the North Mori Gate to the East, the Nagori Gate to the South and Talaqi Gate to the West. The palace, popularly known as 'Gujari Mahal', was made for his beloved. The Gujari Mahal still stands in its austere majesty. This palace is a complex of different buildings, including the royal residence of the sultan Firozshah, Shahi Darwaza, Diwan-e-Aam, Baradari with three tehkhanas, a Hamam, a mosque and a pillar. In 1408, Hisar fell into the hands of the rebels, but was recovered by the royal army under the Emperor Mahmud Tughlaq. In 1411, the tract of Hansi came into the hands of Khizar Khan, and he ascended to the throne of Delhi in 1414 as the first Sultan of Sayyad Dynasty. When Mughal emperor Babur invaded India in the 1524-26, Hisar was an important strategic center of Ibrahim Lodhi's empire. Before the battle of Panipat in 1526, on reaching the Ghaggar, Babur learnt that the troops from Hisar, led by Hamid Khan, were advancing towards him. He then dispatched Prince Humayun with a sufficient number of army, who succeeded in defeating the enemy. Babur handed over the city of Hisar to Humayun as a reward for his success in his first military expedition. Humayun ruled over India twice first from 1530 to 1540 and again from 1555 to 1556. During his first reign, a mosque known as Jama Masjid was built here by Amir Muhammad in 1535. During Akbar's reign (1556-1605), Hisar once again became a place of considerable importance. It was made the headquarters of the revenue division known as Sirkar. As some of Mughal princes who were attached with Hisar, subsequently became the emperors. The last noteworthy actor in the history of the tract of Hisar before the advent of the British power was George Thomas (1756-1802), an independent ruler Jahaz Pul and the Jahaz Kothi situated to the east of the city of Hisar, still remind of the great Irish adventurer. Thomas who used the Jahaz Kothi, which was once a Jain temple and afterwards converted into a mosque, as a residence. It gained importance in early sixties when Agriculture University was setup as an extension of the Punjab Agriculture University, Ludhiana. Ever since, the government 's positive policies have played a vital role in the economic development of the city. The industrial policy of the government has attracted large number of entrepreneurs and has led to industrialisation in and around the city. 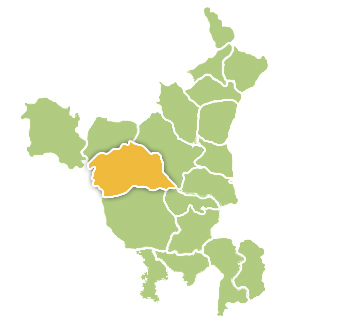 Linking Roads: Hisar is also connected to Ambala-Hisar Highway on NH – 65. Postal Code: 125001 | Longitude: 75°43'6" east | Latitude: 29°9'11" North | Area: 3787.90 sq. km | Altitude: 215 metres | Population: 1,742,815 (Census 2011) | Literacy Rate: 73.20% | STD Code: 01662 | Villages: 275 | Language: Hindi, English | Best season to visit: All seasons to visit. The nearest airport is Indira Gandhi International airport (IGI) which is about 177 km from the town. A major railway junction, Haryana Express and Kisan Express are two important trains that stops at Hisar junction. There are regular bus services from Hisar to Delhi, Chandigarh and Rajasthan.